The lack of a grammar checker is a pet peeve of many OpenOffice.org users. But there is a solution for those who are in desperate need of grammar checking capabilities in the productivity suite. 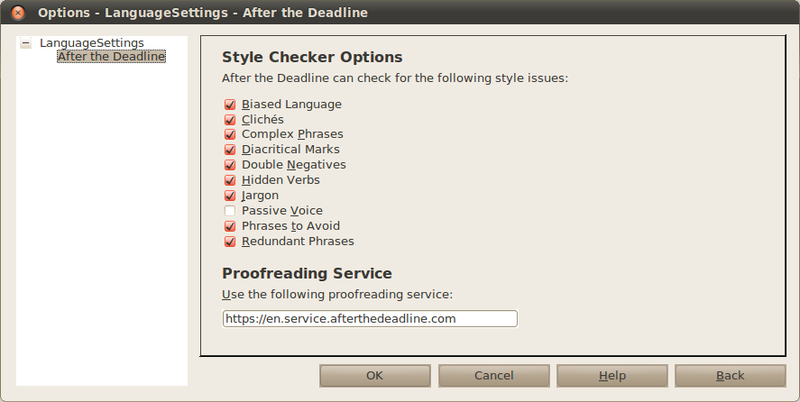 The After the Deadline (AtD) extension adds a grammar checking feature based on the open source language checking server developed and maintained by Automattic (the company behind the popular WordPress software). The AtD server uses a combination of artificial intelligence and natural language processing technology to find writing errors and offer smart suggestions. To make use of the AtD extension, you need OpenOffice.org 3.2 or later and Sun Java Runtime Environment 1.5 or higher. Installing the AtD extension is a pretty straightforward affair. Grab the latest version of the extension. In OpenOffice.org, choose Tools | Extension Manager, press the Add button, select the downloaded .oxt file, and press Open. Restart OpenOffice.org, and you are done. Before you start using AtD, you have to specify what kind of grammatical and style issues it should detect. To do this, choose Tools | Extension Manager, select the AtD extension, and press the Options button. Enable then the desired options by ticking the appropriate check boxes. Press OK when done. That’s it, AtD is ready to go. Start typing, and when AtD detects a grammatical issue, it highlights it using a blue wavy line. Right-click on the highlighted fragment to view a brief description of the issue and its possible solution. By default, the AtD extension uses the official AtD server, which requires an Internet connection. But you can also deploy the AtD server on your machine, which lets you use the service even when you are offline. To install the AtD server, download the latest AtD distribution from the project’s Web site, unpack the downloaded archive, switch to the resulting directory in the terminal, and run the ./run.sh command (or ./run-lowmem.sh command if your machine has no more than 1.5GB RAM). Next, choose Tools | Extension Manager, select the AtD extension, press the Options button, and replace the default URL in the Proofreading Service section with http://127.0.0.1:1049. Press OK, and you are done.